Five Minutes With… is a regular series spotlighting vibrant, innovative, sustainably-focused brands so you can get to know the best and brightest in the industry, even if you only have a quick coffee break to spare. 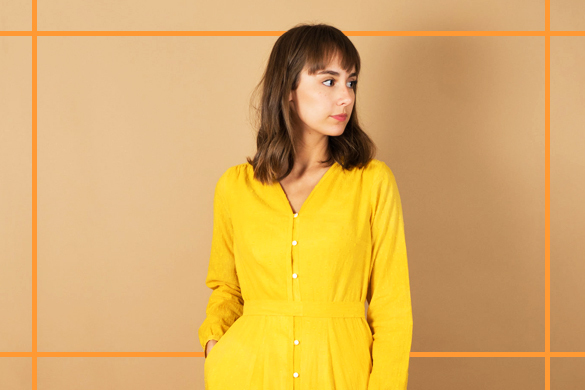 This time we’re spending five minutes with Margu, a sustainable, vintage-inspired label considerately run by Emily DeLong. How would you describe Margu to someone in a hurry? Clothing made slowly and thoughtfully. How did the label come to life? While working a not-so-satisfying 9-to-5 several years ago, I started sewing again in my free time and began dreaming up the idea for Margu. I knew I wanted to spend my time creatively, I knew I wanted to start my own business, and all the while I was getting better and better at making clothes. After a round of layoffs at the company I was working at, I figured I there wouldn’t be any better time to start my label, so I sewed up my first collection (Spring/Summer 2016) in a hurry and have been learning as I go ever since! Who is the Margu Customer? Independent, thoughtful, curious — a woman who seeks to surround herself with beauty in her everyday life, who believes all clothing has a story and that how it’s made is as important as what it looks like, who sees her appearance and her wardrobe as an extension of her self-identity. How does sustainability shape your design process? Sustainability doesn’t exactly shape my design process in the traditional sense. When I’m designing a new piece, I’m not thinking about what I can do to make the piece more sustainable; rather, sustainability is the foundation upon which the entire label was conceived. Sourcing all-natural, predominantly organic and handwoven fabrics, making every piece to order to reduce waste, avoiding trends and designing timeless pieces that won’t be out of style in a year, creating high-quality garments that will last a lifetime are all non-negotiables, and when designing I allow myself to do whatever I want as long as I stay true to that foundation. How much time does it take to make a Leonor dress? The Leonor [pictured above] is one of the trickiest pieces to sew in this collection (so many panels and seams and buttons!) and takes around 8-10 hours to make. That includes laying and cutting out the fabric, piecing and sewing together the dress and its lining, and sewing on buttons by hand. That doesn’t include dyeing and preparing the fabric or designing and drafting the pattern, though! How it’s made is as important as what it looks like. How do you take care of the details? As a self-described “extremely detail-oriented person,” I’m always living among the details, from the angles and measurements of my patterns to the seams and stitches of my garments. I like to think that what makes a great piece of clothing (or any physical object, for that matter) is getting the details right, which is why I focus so much on them with Margu. And finally, is there a Margu piece you just couldn’t live without? Oh, that’s tough! My personal wardrobe is about one-third Margu at this point, so I’m always wearing my own pieces. From our most recent AW17 collection, I’d I have to say I can’t live without the Ivy Skirt in Evergreen Corduroy — it matches almost everything in my closet and can be styled in so many different ways! Besides that, my favorite Margu piece to date is probably the Wallflower Dress from AW16 — I really feel like myself when I wear it, and it’s the one piece in my wardrobe I find myself gravitating toward when I’m not sure what to wear. Every single piece in the collection is designed, cut and sewn in Emily’s tiny studio in Arkansas, USA, and the considerate approach doesn’t stop there. From the fabrics which have been carefully sourced for their sustainable, low impact credentials to the 100% natural threads and vintage buttons, there isn’t a single detail of any garment which hasn’t been thoughtfully conceived and created. Discover more and shop the collection on the Margu website.